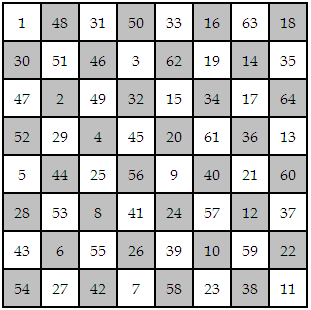 The Knight tour is a mathematical problem where through a sequence of moves according to the rules of chess, a knight placed on any square, moves across the board visiting each square exactly once. The swiss mathematician, Leonhard Euler is credited with coming up with the first suitable solutions to this problem in the late 1770’s and hence, it is even referred to as the Euler Chess&Knight problem. One of the earliest paths suggested by Euler is represented below- where starting from the 1 in the corner, the knight traces a path in the order of the numbers- similar to a connect-the-dots problem. Here, the path finishes in the square adjacent to the starting point, and since it cannot directly move back to its starting point, it’s an “open” tour. Later, the paths were revised and “closed” paths, where the knight gets back to the starting point, were also found. The Paduka Sahasram,is an epic poem of 1008 verses praising the footwear of Lord Ranganatha of Srirangam written by a mulitilingual poet Sri Vedanta Desika, who lived in India, during the 14th and 15th century. It is said that by the age of 20, Vedanta Dasika had mastered most of the scriptures, and was invited to polemics and debates held across the country. Vedanta Desika wrote in the languages of Tamil, Manipravalam and Sanskrit, and the excellence of his work in all the languages earned him the title of “Kavi Tarkika Simha” meaning the Lion among all poets. He also wrote commentaries on a lor of scriptures and was considered to be an authority on Vedanta. It is believed that the Paduka Sahasram was written by him one night, when he was challenged to compose 1000 verses on Lord Ranganatha before day-break. 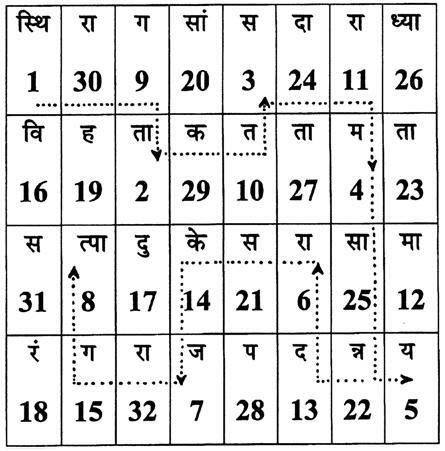 The work has one shloka, that actually solves the Knight tour problem. In the solution presented by him, there are 2 sanskrit verses; where the first verse is written in order, in the squares of the chessboard; and a knight tour of this square leads to the second verse! O sacred sandals of the Brahman, you are always adorned by those who have committed unpardonable sins; you remove all that is sorrowful and unwanted; you create a musical sound; (be pleased) and lead me to the feet of Lord Rangaraja. The sandals which protect those who shine by their right attitude, whose place is the center of the blissful rays, which destroy the melancholy of the distressed, whose radiance brings peace to those who take refuge in them, which move everywhere, -may those golden and radiating sandals of the Brahman lead me to the feet of Lord Rangaraja. Remember this work was written in the 14th and 15th century, a long time before Euler was even born. The verses reflect the sheer genius of the poet :)- Coming up with two verses, one derived from the other that too by a knight tour! I Found this when reading a book called ‘The Wonder that is Sanskrit’ by Sampad&Vijay and thought i should definitely share it! It is remarkable the way early Indians came up with extremely accurate findings in the fields of science, astronomy and math. Sadly we haven’t got credit for a lot of the discoveries, and some have gone unnoticed. This is something the present generations could, and should perhaps use, to derive inspiration from :). Just reflect the same moves on the other side.